Herta Oberheuser (15 May 1911 in Cologne, German Empire – 24 January 1978 in Linz am Rhein, West Germany) was a Nazi physician and a war criminal who worked at the Auschwitz and Ravensbrück concentration camps from 1940 until 1943. Oberheuser is sentenced to 20 years' imprisonment at the Doctors' Trial. In 1937, Oberheuser obtained her medical degree in Bonn, having specialized in dermatology. Soon thereafter she joined the Nazi Party as an intern, and later served as doctor for the League of German Girls. In 1940, Oberheuser was appointed to serve as an assistant to Karl Gebhardt, then Chief Surgeon of the Schutzstaffel and Heinrich Himmler's personal doctor. Oberheuser and Gebhardt came to Ravensbrück in 1942 in order to conduct experiments on its prisoners, with an emphasis on finding better methods of treating infection. They conducted gruesome medical experiments (treating purposefully infected wounds with sulfanilamide, as well as bone, muscle, and nerve regeneration and transplantation) on 86 women, 74 of whom were Polish political prisoners in the camp. She killed healthy children with oil and evipan injections, then removed their limbs and vital organs. The time from the injection to death was between three and five minutes, with the person being semi conscious until the last moment. She performed some of the most gruesome and painful medical experiments, focusing on deliberately inflicting wounds on the subjects. In order to simulate the combat wounds of German soldiers fighting in the war, Oberheuser rubbed foreign objects, such as wood, rusty nails, slivers of glass, dirt, or sawdust into the cuts. 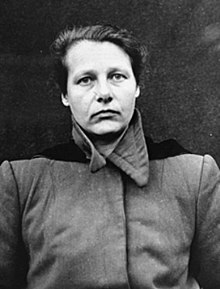 Herta Oberheuser was the only female defendant in the Nuremberg "Doctors' trial", where she was sentenced to 20 years in prison – a sentence later reduced to five years. Oberheuser was released in April 1952 for good behavior and became a family doctor in Stocksee, near Kiel, in West Germany. She lost her position in August 1958 after a Ravensbrück survivor recognized her, and Herr Helmut Lenke revoked her medical license and shut down her practice. Oberheuser appealed to the Schleswig-Holstein administrative court, which rejected the appeal in December 1960. She did not practice medicine again and was fined as punishment. She died in January 1978 at the age of 66. ^ a b c d e Mikaberidze, Alexander (2013-06-25). Atrocities, Massacres, and War Crimes: An Encyclopedia [2 Volumes]: An Encyclopedia. ABC-CLIO. ISBN 9781598849264. ^ Dawson, Mackenzie (2016-05-08). "After Hitler's pal died, Nazis recreated his injuries in a sick experiment". New York Post. Retrieved 2017-06-19. ^ Cymes, Michel (2015-01-14). Hippocrate aux enfers - Chapitre 13 - "Elle n'était pas mauvaise" - Herta Oberheuser (in French). Éditions Stock. ISBN 9782234078413. ^ Wodenshek, Haley (2015-04-01). "Ordinary Women: Female Perpetrators of the Nazi Final Solution". Senior Theses and Projects.